A massive float depicting American President Donald Trump made its debut on Saturday at the Viareggio Carnevale in Italy. According to the festival’s website, the impressive float, titled “The Master-Drone” by Fabrizio Galli combined Trumpian iconography, including a Twitter sword, with armor from the Warhammer 40,000 wargame. The Viareggio Carnevale has taken place since 1873 and is considered to be one of the most renowned festivals in Italy and Europe and frequently includes political statements. President Trump has been a frequent subject in the parade since his election. Footage of the Viareggio Carnevale parade broadcast by NoiTv Lucca showed the massive ‘God Emperor Trump’ float make its way down the parade route in Viareggio, Italy. Trump’s head, hands, eyes and arms were able to move, showing the president scanning the crowds that amassed for the annual event. 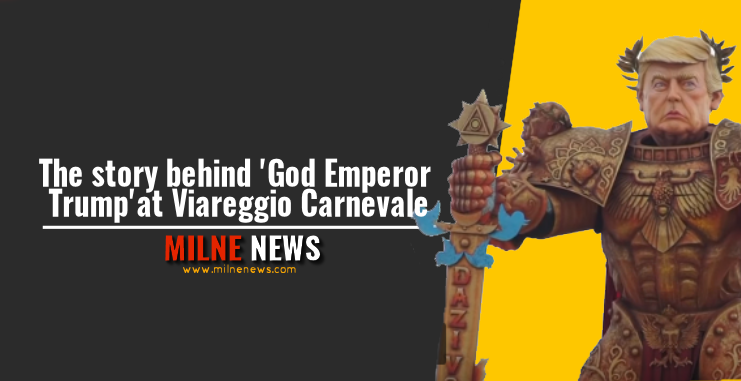 The 2019 Viareggio Carnevale took place on Saturday and Sunday and will again on February 23, March 3 and March 5.